Apple provided you with a marshmallow-sized 10-watt power adapter that can top off your batteries toot sweet. It's even super-convenient to travel with. But I've found two different alternative power products that have proven to be worth their weight in your favorite material with a high Value to Weight Ratio. Apple's charger does a great job, it's tiny, and you got it for free with your iPad. So why bother spending about $80 (street price) for this dealie from Targus (www.targus.com)? Because it's geared towards the problems of travel. It's modular. It can power and charge your iPad from any 110V-220V outlet in the world, but you can also swap in an included adapter to charge from your car or airline seat power. The AC power spades rotate a full 90 degrees, which means that you can sneak it into any available outlet...like the one remaining port on a shared power strip that only still available because nobody can squeeze their own power bricks in there. The business end of the charger splits in two. You can charge any two devices at once from this same adapter. And I do mean "any": you snap on a power tip for the devices you own. Traveling with an iPad and an iPhone? iPad and a Blackberry? iPad and a camera? Snap on the right two tips and you've got the problem solved, minus the bulk of multiple chargers. An external battery pack falls firmly in the "You'll never need one...until the one time you wish you had it." The iPad packs ten hours of battery life. That's clearly enough to last you through a whole day without needing a recharge, right? Right. You make a good point. I salute your intellect and savvy...and I'm not just saying that because you've bought my book. But it's not hard to come up with scenarios in which those 10 hours can be stretched thin. I live in Boston and often fly to the west coast. 90 minutes in a crowded airport waiting area where I can't find an outlet plus a six-hour flight can easily put me in San Francisco at 1:00 p.m. with an afternoon's worth of business ahead of me and a battery at 50 percent. And that's not a worst-case scenario. I might have forgotten to top off the battery before I went to bed. My flight might get delayed. Once every couple of years, I truly am in a Seriously Ill-Considered mode of transit and I'm away from outlets for 20 hours. In all of those situations, and just in general principle, it's a relief to know that I filled up a box of spare electrons before I left the house. I'm old enough to have traveled with laptops that only ran for two hours on battery. If there was any chance that I needed to use it after I landed, I couldn't watch movies or do anything fun with it on the flight. I will die, or kill, before I am dragged back to those barbaric times. Which is why I often carry an external battery pack when I travel. It's a safety net and a free pass to go ahead and spend hours gaming, reading, viewing, and otherwise piddling away my iPad's stored charge with full Gatsby-like abandon. Many companies make these things: it's a simple gadget, just a stack of batteries in a semi-attractive case. It'll power or charge any device that you can plug into its USB port. The iPad is a special kind of beast that draws a lot more power than a smartphone. You need a charger that's rated for it. New Trent's IMP1000 (www.newtrent.com) can pump out 11000 mAh of power is up to the task: it can fully recharge the iPad from zero, or double the running time of your iPad's battery if you just leave it plugged in. 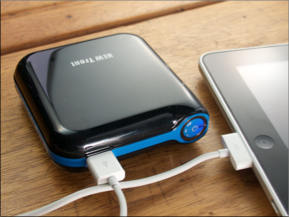 New Trent's IM-P100 power pack provides extra juice to your iPad when recharging from a power source isn't available. And remember: it'll revive any device that can charge via USB. I like the New Trent because it's affordable ($80 street), compact, and easy to use. It means that when a storm cancels all outbound flights, you won't have to go from passenger to passenger in the terminal, begging for thirty minutes on their outlet like some sort of damned animal.